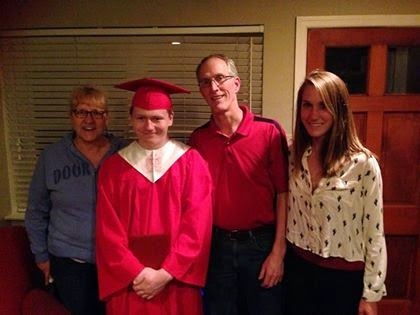 My nephew Edmond graduated from High School tonight- Wahoo! 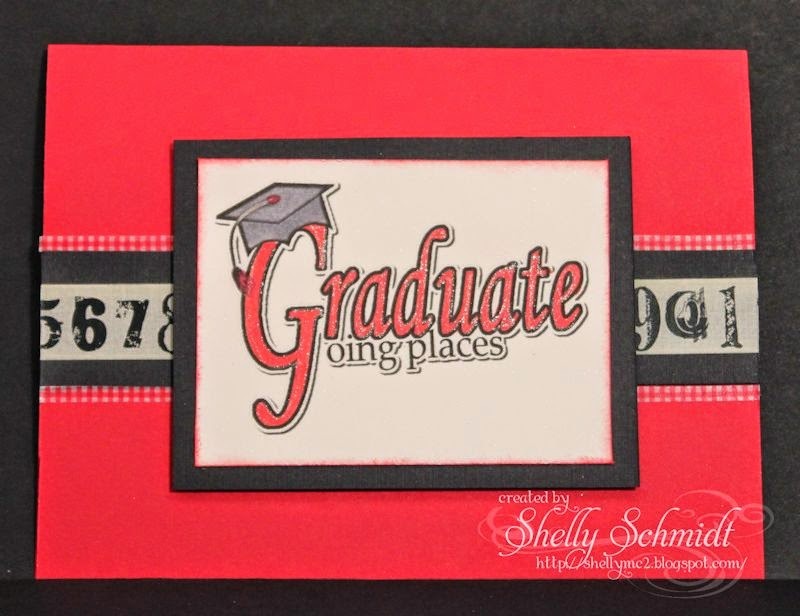 Cardstock is Real Red by SU, Black and Cryogen White. The digi image is by Create with TLC. I used some Washi tape on the center strip. 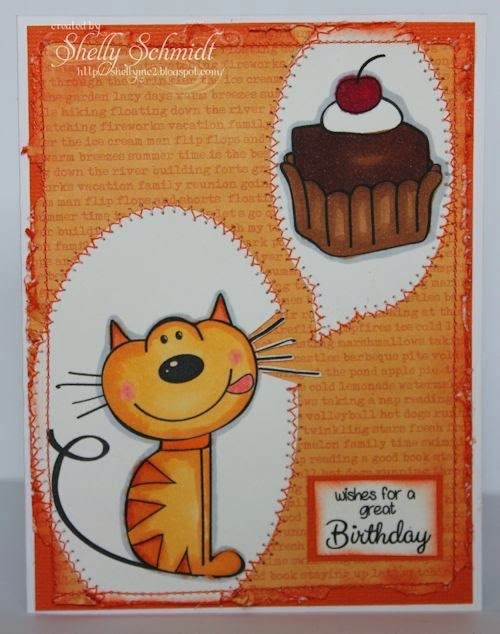 Another card using Real Red, Shimmery Yellow and White cardstocks. The digi image is by Create with TLC. I colored in the lettering with Copics and added Sakura Gelly Roll pen. The grungeboard star is covered with Red ink, then I painted on Creative Inspirations paint in Garnet. I made a couple more cards to send to my elderly Aunt- they have to be CAS for her for mailing purposes....I saw a tutorial over at Mark's Finest Papers for Masked Borders and thought I would give it a go. ALl images are by MFP. 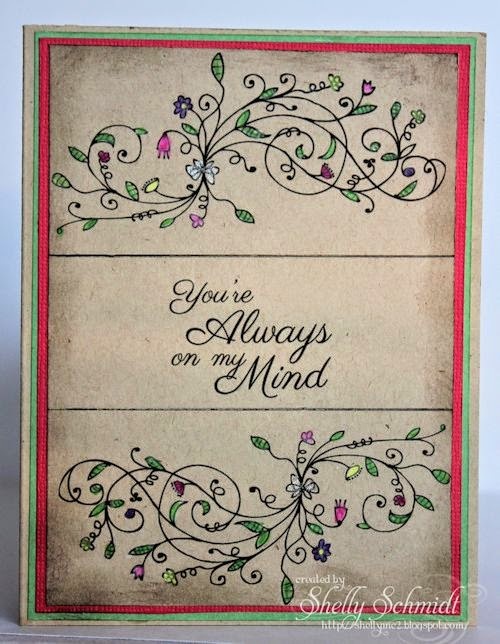 The top card was colored using Prismacolor pencils and I added shimmer with a Sakura Gelly Roll pen. The 2nd card- I colored with Copics. 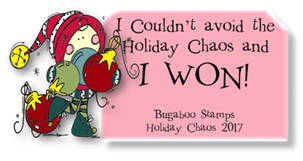 It's time for the Tuesday challenge at Sweet Stamps . 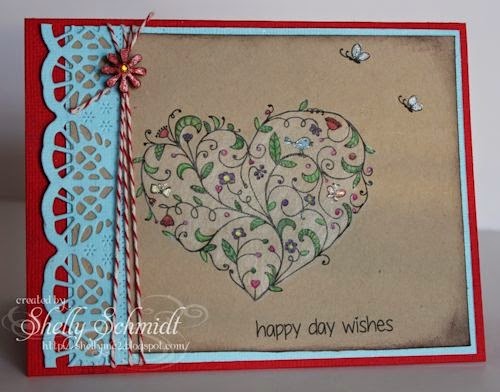 Our challenge theme for this week is, 'No Designer Paper'. 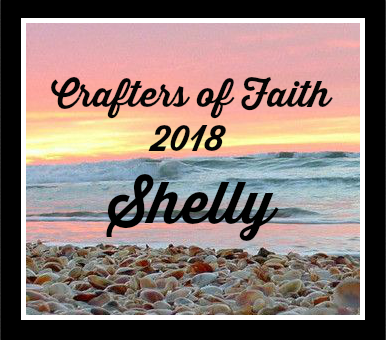 I used a technique called Build a Background from the April/May '14 Technique Junkies newsletter. 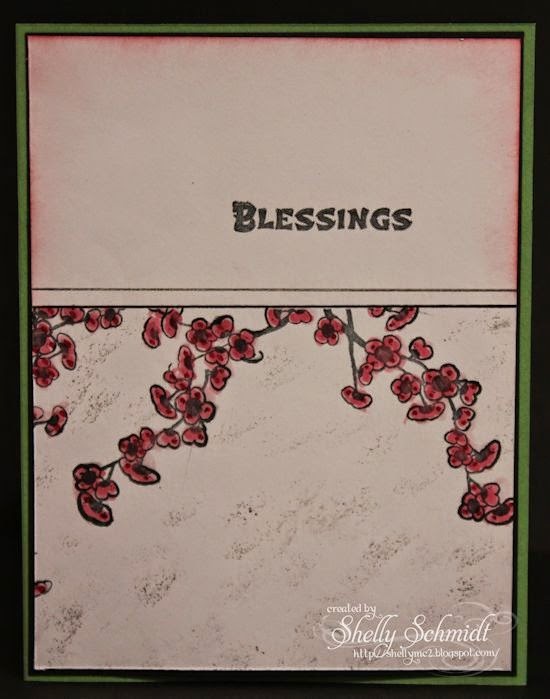 I used 'springy' colors for the Creative Corners image- and I used the medium sized stamp in this set.I added a layer of Vellum over the top to soften the background. 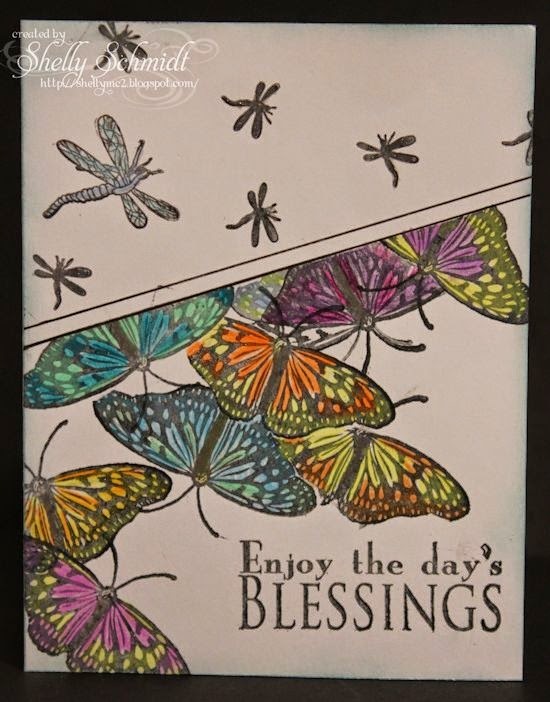 I stamped the three butterflies on Vellum and then on white card stock-which were fussy cut out. 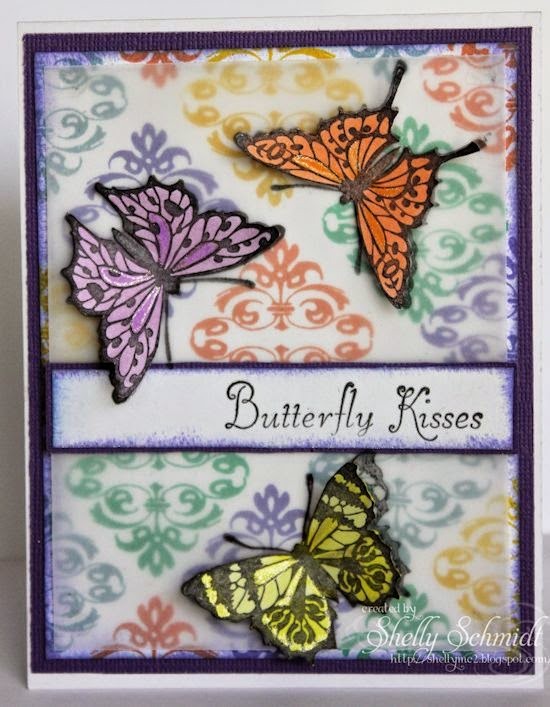 I just applied glue to the center of the butterflies- lots of dimension! 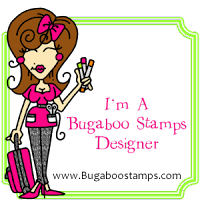 The Creative Corners stamps are new in the SweetStamps.com store- HERE is the link to the entire line. Each set of images comes in a set of three clear stamps- a small, a medium and a large image.